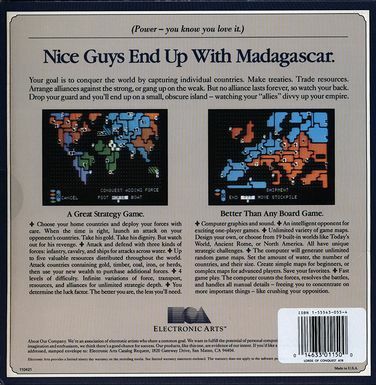 This was the phrase on the back of the box for one of the most addictive strategy games of the late 1980s, Lords of Conquest, by Electronic Arts. I played this as a teenager and, looking back from this era of virtual-world games, I’m a little surprised at how compelling it was. But as gaming goes, the basic concept has stood the test of time: manage resources, equip armies, and take over the world. I recently was reminded of it because I reviewed Gabrielle Hecht’s new book on the uranium trade in Africa, Being Nuclear. (I’ll link to the review later when it is published). It turns out that Madagascar—surprise!—is not quite the meaningless backwater portrayed in the game. Madagascar was an essential part of France’s nuclear program, and President Charles De Gaulle went out of his way to ensure that, throughout the process of decolonization, no one tried to wrest Madagascar from France. In Lords of Conquest, Madagascar didn’t even make it onto the screen, too unimportant to merit conquest by intrepid game-playing teenagers. Ironically, that fits quite well with Hecht’s theme in the book, because the uranium mines in Madagascar were fairly invisible too. They went unnoticed by most of the world, and even the miners themselves seemed unaware that they were subjecting themselves to potentially harmful doses of radiation in the service of the French force de frappe. But more on Being Nuclear later. Right now let’s put our geek caps on and talk about how much games reflect our values and worldviews. Should the management of dwindling resources, so pervasive in the design of strategy games today, be considered an “environmental” point of view? In my forthcoming book Arming Mother Nature, I spend some time discussing the relationship between early environmental modeling and the heyday of game theory in the 1950s and 1960s. These were years when cooperative games (remember the film A Beautiful Mind?) not only formed the cornerstone of new academic publications like The Journal of Conflict Resolution, but also informed the first economic models that predicted environmental doomsday. The most famous of these was a controversial book called Limits to Growth, but there were plenty of other less well-known models. The point of modeling was to think of all the important inputs and attempt to draw order out of the chaos. Then, given the perceived order, one could attempt to influence it using any number of strategies. Plenty of people contested those doomsday theories, and I’m not going to try to convince you that they were correct. However, the prevailing idea in them was to focus attention on the non-renewable nature of important resources, and the potentially devastating effects of not adjusting and adapting. Some said humans should stop being so rapacious, to ratchet back on what is produced and consumed. E. F. Schumacher’s Small is Beautiful was the classic statement. If we treated natural resources as capital, he argued, we wouldn’t be so eager to spend them down. Others counted on technology and market adjustments to help humans adapt to changing times. Think of Arnold Schwarzenegger’s hydrogen-fueled, non-girly-man Hummer. But what’s fascinating to me now is that anyone who plays a strategy game today is enacting those same values. Lords of Conquest didn’t have dwindling resources (at least not that I remember!). The resources were static, and the goal was to control them. By controlling them, one could support more troops, and thus control them even better. That’s the classic worldview of empires—carving up the world’s resources and competing for them. In those games, dynamism came from the ebb and flow of human control, not in the availability of the resources. Games today are more cynical. Resources get used up. Solutions usually involve more sophisticated technology, not restraint (sorry, Schumacher!!!). After all, restraint is no fun in a strategy game. Still, there is definitely no sense of infinite resources in games; no sense of carving up the pie and controlling it. Instead, you have to eat the pie, and once you do, it’s gone. The most popular games incorporate the idea that resources are quickly depleted and must be renewed. This is especially so of real-time strategy games like the Age of Empires or Starcraft franchises, which set a premium on one’s ability to adjust to changing economic circumstances quickly. OK, I get it. They’re games, and they are supposed to be fun. Don’t over-think it. But I’m willing to go out on a limb and say that these games ARE environmental, in that they reinforce among their players that the central economic problem is one of resource availability in a world of dwindling supplies. But strangely enough the gaming solution typically reflects strategies that are quite real when measured against history: find resources, deplete them, find more, and develop technology to mitigate the problem, all while continuing to grow, grow, grow. In games, small is not beautiful. One of the great ironies of Starcraft, I think, is that while it takes place in a futuristic setting, it basically uses a Genghis Khan-model for imperial warfare: travel to the place of battle, and live off the land in the most extractive way possible. One can contrast this with the economical/imperial model in the Civilization or Alpha Centuri series, where the goal is usually to end up with a robust economy that ends up being the engine that pays for the imperial ambitions. You still don’t generally have to worry about logistics (such a major component of the history of warfare, and yet more or less ignored in all strategy games that I have seen), but at least it isn’t run on the model that all field commanders are somehow building their own production factories (which is patently absurd). Good point. Extraction is the name of the game, not only in games but in life. Even the (real) ultra-futuristic programs that some folks want to support, like space exploration and planet colonization, often point to dwindling resources on earth and potential resources to extract from other planets. It’s new technology, but not new vision/practice. The real irony is the search for intelligent life, and the perverse and ahistorical notion that it can end well if we ever find it! As for logistics, maybe there’s a market for UPS-Craft?